The easiest way to inflate balloons. Just plug it in and you are ready to fill balloons up with air. Use the convenient rocker switch for continuous use or simply depress the nozzle for momentary use. Patented Design products from overheating. Includes a variety of adapters. Works great with latex & reusable balloons! Industry standard high speed polisher. Heavy-duty variable speed (0-1,000/3,000 rpm) electronic polisher features a powerful 8.0 amp, 120V AC/DC, all ball-bearing motor for long life. Electronic module provides full power, even under load, from 1,000-3,000 rpm. Conveniently located variable speed dial lets you adjust speed for different materials and applications. Heat-treated, precision-cut gears for smooth operation. External brush caps for easy servicing and spindle lock for easy pad changing. Heavy-duty 6 in. poilsher/sander with electronic variable speed. Variable speed from 4,300-6,800 opm provides greater control of material removal rate. Controlled Finishing System maintains pad speed and minimizes gouging during start up. Dual-plane counter-balanced fan reduces user fatigue. Sealed 100% ball-bearing construction. Accepts 6 in., 6-hole hook and loop paper. Rubber-coated gear case for low vibration operation. The Porter-Cable 6 in. Variable Speed Random Orbit Polisher is packed with user-friendly features and has a random orbital motion that makes removing swirls, polishing paint and applying wax a breeze. Featuring a 4.5-Amp motor and electronic variable-speed dial that operates at 2500-6800 OPM, this polisher is suitable for professional or DIY projects and has multi-directional motion for faster operation and consistent motion for better results. Featuring a compact and lightweight design, the removable side handle allows improved control and versatility, who 100% ball/roller-bearing construction ensures lasting reliability. 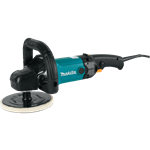 Dual action Makita Polisher has a random orbit with forced rotation and free rotation settings.